Most popular lenses to help while driving ... staying safe. What does eyecare, eyewear and driving have in common? According to Dr. Mark Roy of Oakland Optometry in Rochester Hills, surprisingly, a lot. "Selecting a pair of glasses for driving may seem like a simple task. However, there are many options for eyewear and features on lenses that can significantly improve (or hinder) your vision while driving. It’s important to know what lenses will give you the best vision while driving and steer away from certain lenses that can create additional vision issues," said Dr. Roy. Polarized Lenses – Polarized lenses are the perfect solution for driving glasses. They do a great job of cutting the glare and reflection that come from your dashboard and windshield. Polarized lenses are also great for cutting the glare from things like ice, snow, wet roads, and other vehicles. Tinted Lenses – Tinted lenses can be a great benefit for some patients in reducing eye fatigue while driving. Photochromic lenses, optical lenses that darken on exposure to bright light, are also a good option for drivers who need corrective lenses for daytime and night driving. New advancements in the technology for photochromic lenses now allow for darkening, even with the UV protection provided by your windshield. It is important to remember that if you have tinted lenses that are not photochromic, you should avoid wearing them during dusk and dawn since they will decrease your vision. Anti-Reflective Lenses - anti-reflective lense treatment improves the performance of every lens prescription. For daylight driving, it allows the formation of a clearer, sharper retinal image. For night driving, anti-reflective lenses help reduce the effects of "ghost" images caused by light internally reflected within the lenses. 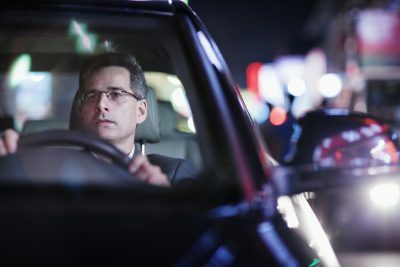 If you do a lot of driving at night and need to wear glasses, there are lens options that will help improve your vision. As you get older, it becomes more difficult to see at night. This change is more pronounced for people who are nearsighted. Patients that notice a difference in vision at night can benefit from anti-reflective lenses that reduce the glare from headlights and taillights, improving distance vision. Additionally, there are several lenses designed specifically for driving. These lenses are coated with a unique anti-reflective coating that not only reduce glare and reflections, but also reduce light at the blue end of the spectrum, which sharpens vision, and reduces impacts from myopic shifts at night. Dr. Mark Roy and his optical team at Oakland Optometry are the experts in lense options. This is really an important consideration when you are selecting glasses for driving. If you suffer from conditions like dry-eye, you may want to consider a frame that has wrap around lenses. This will give you added protection from breezes from your heater and air conditioner. Wrap frames are actually a great option for any patient that needs to wear glasses for driving only. If you aren’t sure what eyewear works best for driving, ask the optical team at Oakland Optometry. Dr. Mark Roy of Oakland Optometry in Rochester Hills knows that it can be a challenge to find the best eyewear and lenses to correct your vision for driving. If you need new glasses and lenses to help with driving, Dr. Mark Roy of Oakland Optometry and his optical team are ready to help you. To schedule an appointment with Dr. Roy or to learn more about our full range of vision services, call us at (248) 373-6500.